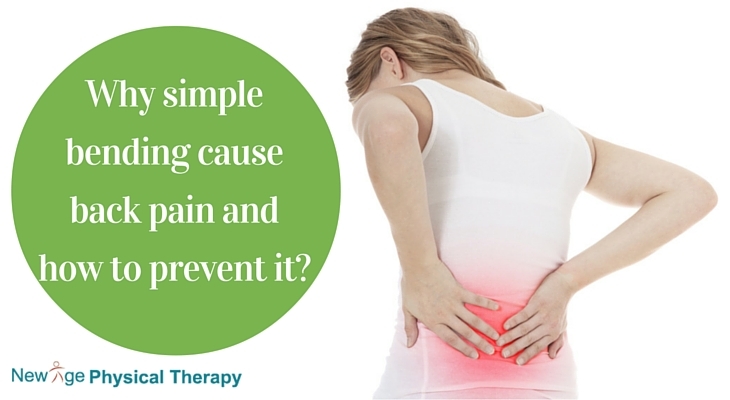 Comments Off on Why simple bending cause back pain and how to prevent it? Lot of people get lower back pain or get very stiff in lower back lifting something simple light weight from floor or just bending over to do something. If it’s something not heavy or it’s like routine bending why do we get this kind of pain and/or stiffness? One of the most important changes happens in forward bending is you lose your normal forward curvature in your spine called lordosis. Constant reversal of lordosis can put stress on your disc, spinal joints and muscles. It can also happens after you worked out heavy, lifted lot of boxes, did yard work, moved furniture in house and next day your muscles are tight or sore from that and you try to bend down and even little twist with it can send spinal muscles in spasm. So is there a way to prevent this kind of pain, locking of back or have sciatic kind of pain? When bending forward to pick up things there are few things which can help you to keep your spine in an appropriate position and minimize strain on your low back. 2. When you reaching objects go close to them don’t reach out from distance. 3. Don’t twist your spine too much while lifting object tries to stand in front of object and then lift. If you are sore from previous day work out or any other lifting activity take it easy on your back for few days and follow simple lifting procedure mentioned above. If you are still experiencing low back pain, visit to your licensed physical therapist. He or she can teach you exercise for your back. Your physical therapist can also teach you how to obtain and maintain proper posture for your back. By learning the proper ways from Physical Therapy Great Neck, NY to lift, you may be able to maintain your spine in an optimum position to prevent episodes of debilitating back pain.